Forget what you think you know about corporate retreats. When done the right way – we aren’t talking all-inclusives or spas – these retreats are a proven business tool that can help you and your employees grow as individuals and as a team. There is a stigma surrounding the term “Corporate Retreat.” When many people hear the phrase, they envision lavish getaways to all-inclusive resorts or spas where employees are wined, dined, and pampered. It is this negative image that is partially to blame (the bad economy certainly didn’t help) for these afternoon-long, day-long, or weekend-long events falling out of favor. In fact, interest in corporate retreats is down nearly 90% from 2005, according to Google Trends. Well, don’t you worry. In the words of rapper LL Cool J, don’t call it a comeback. Corporate retreats are back in the spotlight, and for good reason. They work! For starters, retreats can help build morale. Just getting out of the office and doing something fun is a great way to reward your employees for all of their hard work. However, the other benefits of corporate retreats are much more substantive and less superficial. So let’s move on. Building a team is the easy part. Teamwork, on the other hand, doesn’t always come quite so easy. One way to improve teamwork is to put your team in situations where they are encouraged to interact, communicate, and problem solve as a group. This is where your corporate retreat can be beneficial. 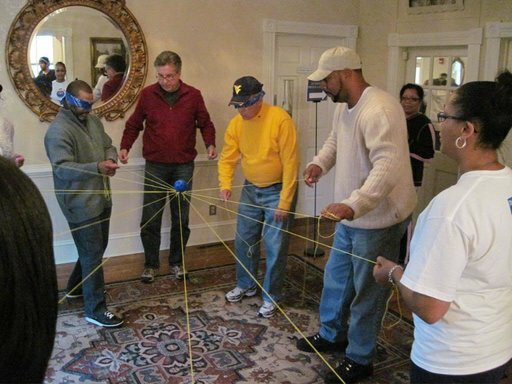 Through a series of team building activities, presented in fun and creative ways, challenge your group to break down communication barriers and work together to solve certain problems. After each exercise, the participants and their facilitator discuss the lessons behind what they just did. This discussion is designed to reinforce these lessons and help ensure that the progress made during your corporate retreat is not lost after a few days’ time. Corporate retreats need to be in your business plan for 2015 and beyond. The return on investment is not only immediate, but substantial and long-term. Conveniently located between Baltimore and Washington DC, Terrapin Adventures provides both on-site and off-site team building adventures designed to break down group barriers and help your staff work more efficiently and cohesively. Our custom programs provide for exciting activities that bridge the gaps in communication, improve cooperation, and expand your group’s problem solving skills. To make team building last, we recommend a follow up session to help the team reinforce the learning that took place initially. In fact, why not just make this an annual event? This entry was posted on Wednesday, August 19th, 2015 at 4:41 pm. Both comments and pings are currently closed. It’s interesting to know that when it comes to companies going on all of these different kind of retreats, that there are actual benefits to it. Like how you said, going on one will help build morale, that way their employees feel appreciated for all the hard work they have done. I think that is something that will help encourage people to want to do more for work, and in turn make the company a better place.